Panasonic has to some degree been the pioneer of the superzoom compact camera, with a string of pocket-sized models featuring incredible optical zoom capabilities dating back over 10 years now. 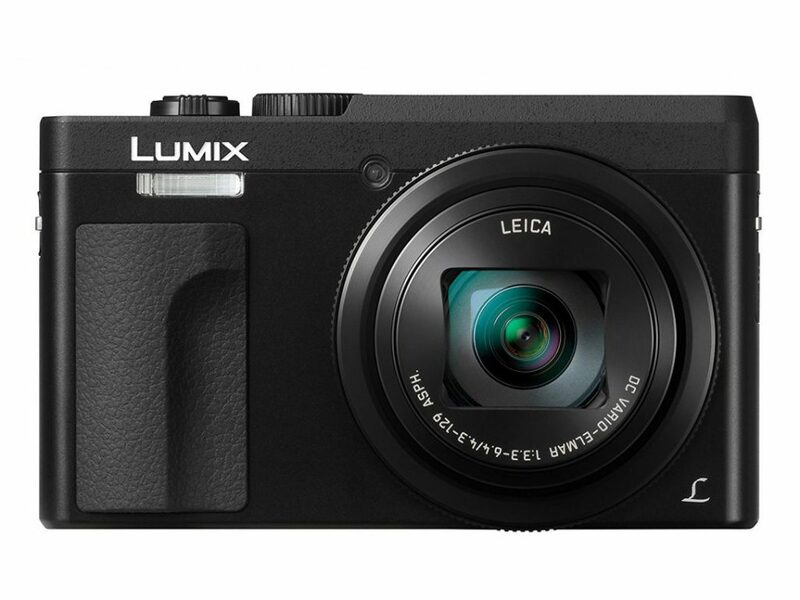 The Panasonic Lumix DC-ZS70 (ZS70) is their latest offering, featuring a 30x optical zoom, tilting LCD screen, 4K-video, and an increased 20.3Mp resolution, compared to 18.1Mp on its predecessor, the ZS60. The sensor technology remains the same, utilizing a 1/2.3-inch backside-illuminated sensor similar to the ZS60’s, positioning the ZS70 just behind Panasonic’s flagship ZS100 superzoom compact, which has a physically-larger 1-inch sensor. The ZS70’s 30x optical zoom offers an equivalent wide-angle 24mm through to super-telephoto 720mm focal range, providing great coverage for photographers who want to travel light. The inclusion of a 5-axis Optical Image Stabilization (OIS) system should help ensure sharper shots of relatively static subjects at longer focal lengths, too. The ZS70 shoots both RAW and JPEG file formats, with the latest version of Panasonic’s Venus processing engine crunching the JPEGs and offering a native ISO 80 to 3200 sensitivity range, expandable up to ISO 6400. 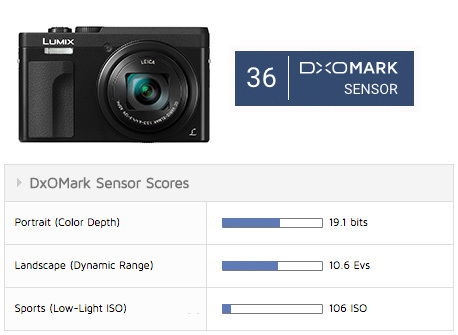 The Panasonic ZS70 achieves an overall DxOMark sensor score of 36 points and offers very comparable image quality to its predecessor, albeit with slightly increased resolution. Its best results for color and dynamic range are achieved at base ISO 80, where it scores 19.1 bits for color depth and 10.6 EV for dynamic range. The ZS70’s Sports (low-light ISO) score of 106 ISO is the highest sensitivity at which the camera is capable of shooting with a color sensitivity of over 18 bits, and good dynamic range of over 9 EV, with a signal-to-noise ratio of over 30 dB. So the ZS70 is better suited for bright-light environments, where you can keep the ISO low. With good JPEG processing — either in-camera via the Venus engine or in post-production on RAW files — good image quality at higher ISOs should be possible, but the ZS70 isn’t a camera for photographers regularly shooting at mid-to-high ISO sensitivities. Comparing scores against the ZS100, you can see the advantage the large 1-inch type sensor offers over the ZS 70 across the board, with around two stops’ better color (Portrait score) and dynamic range (Landscape score) for the larger sensor at base ISO. That translates into a significantly better low-light ISO (Sports score) result of 559 ISO for the ZS100, making it better suited for photographers who want to pump up the ISO a bit in low light. The same analysis bears out when comparing the ZS70 against some of the superzoom compact competition, such as the Canon G9 X Mark II. Also featuring a larger 1-inch type sensor, the G9 X Mark II offers around two stops’ better color and dynamic range at base ISO, and image quality holds up better as sensitivity increases, ensuring good overall image quality up to 522 ISO. For more details about sensor performance, our in-depth analysis takes a closer look at the ZS70 compared to its predecessor, the ZS60, as well as to the larger 1-inch sensors in the Panasonic ZS100 and the Canon G9 X Mark II. In print results, the ZS70 offers almost identical results to its predecessor, the ZS60, with good color of around 17 bits possible in RAW files up to ISO 400. You can see the two-stop advantage of the ZS100’s larger 1-inch sensor at base ISO, and this increases a little at higher sensitivities, making good color just under 17 bits possible at manufacturer ISO 1600, compared to 12 bits on the ZS70 at ISO 1600 — around a 3-stop difference at mid-ISO. The same is broadly true when comparing color on the ZS70 with the Canon G9 X Mark II. Although color is just under 2 stops better on the Canon device at base ISO, it improves slightly as sensitivity is increased, resulting in a 3-stop advantage at ISO 1600, with scores of 16.2 bits for the G9 X Mark II compared to 12 bits for the ZS70. For dynamic range in prints, again, the larger 1-inch sensors are slightly better than the ZS70’s 1/2.3-inch sensor as sensitivity is increased. Excellent dynamic range of over 10 EV is possible on the ZS100 and the G9 X Mark II up to ISO 800, compared to ISO 200 for the ZS70; and at higher sensitivities, the ZS100 and the G9 X Mark II pull away further, with good dynamic range around 8 EV possible up to ISO 6400, compared to ISO 800 for the ZS70. The ZS70’s signal-to-noise ratio (SNR 18%) stays above the 30 decibel threshold that we identify as necessary for good image quality at its lowest ISO settings, with the same consistent levels of noise as its predecessor, the ZS60. However, as sensitivity is increased, noise becomes more prevalent for both the ZS60’s and the ZS70’s RAW files, and high ISO sensitivities of ISO1600 and above should be avoided if possible, as the SNR drops below the 20 decibel threshold. In comparison, the larger 1-inch sensors in the ZS100 and the G9 X Mark II give you a bit more flexibility to shoot at high ISOs. In prints, good SNRs above 32 decibels are possible up to ISO400, which is a 2-stop advantage over the ZS70. This holds true at very high sensitivities, too, so expect a similar amount of noise on the ZS100 and G9 X Mark II files at ISO 6400 as the ZS70 produces at ISO 1600. A massive optical zoom range, including an equivalent wide-angle through to super-telephoto reach, makes superzoom compacts ideal for those photographers looking to avoid the bulk of an interchangeable-lens camera and several large lenses. Adding a tilting LCD screen, Panasonic has updated the functionality on its latest superzoom compact, the ZS70, and its slightly higher resolution updates it for the current market conditions, too. Overall, the ZS70’s image quality is broadly the same as its predecessor, the ZS60. If you’re looking for better results in low-light environments, you should consider the larger 1-inch sensors in the Panasonic ZS100 and Canon G9 X Mark II. At lower ISO’s, however, the ZS70 remains a very capable device, making it a great travel camera for shooting in bright-light conditions. In this review we have compared the Panasonic ZS70 to its most direct rivals that we’ve tested. As usual, you can create your own comparisons and in-depth analyses using our interactive image sensor ranking tool.